This volume comprises a representative selection of essays - many of them difficult to find - of the late Uriel Tal. 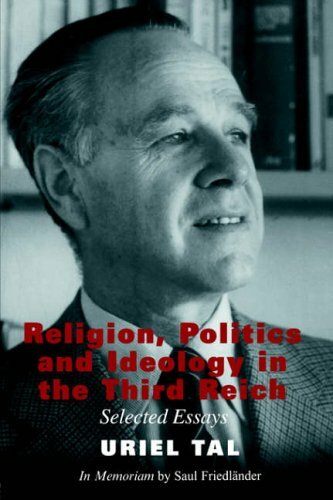 There has scarcely been another scholar who was as keenly aware of what German National Socialism owed to a combination of bowdlerised Christianity and bastardised science, a view he argued with great cogency and formidable scholarship. The cultural depth, clarity of exposition and scholarly richness of Tal's essays will establish formidable standards for the future volumes in this series. This volume also contains a personal memoir of Uriel Tal by Saul Friedlander. Uriel Tal (d. 1984) was Professor of Modern Jewish History at Tel Aviv University and Fellow at the Oxford Centre for Postgraduate Hebrew Studies. He lectured widely in the United States and Europe and was visiting professor in several American universities. His work focused on modern Jewish history and European history, primarily the history of ideas and religious thought. His publications include: Christians and Jews in Germany: Religion, Politics and Ideology in the Second Reich, 1870-1914 (1975); Myth and Reason in Contemporary Jewry (1987, Hebrew); Political Theology and the Third Reich (1991, Hebrew).